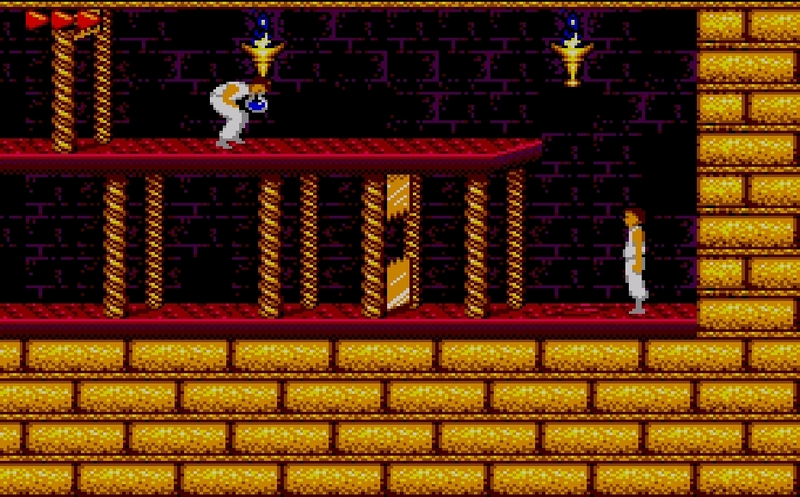 In an era populated by tricky platformers, few were as delightfully devious as Prince of Persia. 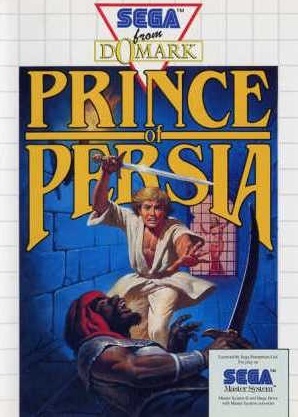 Originally crafted for the Apple II before being ported to near-on every format under the sun, Jordan Mechner’s creation was one of those titles that had you ranting and applauding with a near-schizophrenic intermittence at its masochistic, smart design. 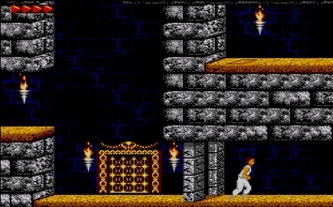 The Master System version, barring the odd small hiccup, is ace. To set the scene: with the Sultan away fighting a war, his vizier Jaffar, who suspiciously enough happens to be a wizard, seizes power, nicking the Princess and threatening her execution should she not take his hand in marriage. Playing as an unnamed stranger (who to avoid headaches, will hereafter be referred to as the Prince), you’re tasked with ‘doing a Mario’ and rescuing the Princess. Oh, and you've only got an hour to do it. PoP is a cut above your common or garden platformer. 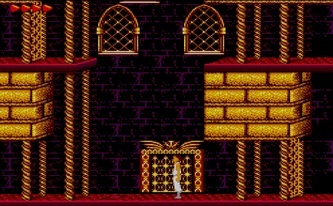 For starters, it handles entirely differently to other platformers of the late eighties. It demands a more scientific approach to judging jumps, even on occasion tasking you to grab ledges to prevent a fall; the setup takes some getting used to, but yields benefits. Its pioneering visuals proved a game-changer; the Prince looks stunning and moves with unerring realism. Mechner studied videos of his brother as a yard-stick for devising the Prince’s animation, and the result is a remarkable attention-to-detail and fluidity that’s unmatched on the format. A simple jump reveals outstretched arms, scrabbling legs and an arched back; turning abruptly whilst running sees the Prince’s arms flail slightly in order to make a swift change of direction, whilst dropping down pits sees the hero desperately falling and, as often as not, ending up impaled on an inconveniently placed spike pit. 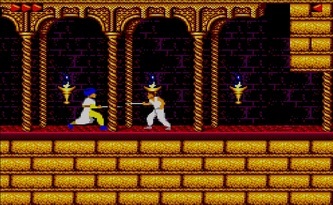 The Persian guards add another layer of class to the mix, engaging the player in some classy sword fights. 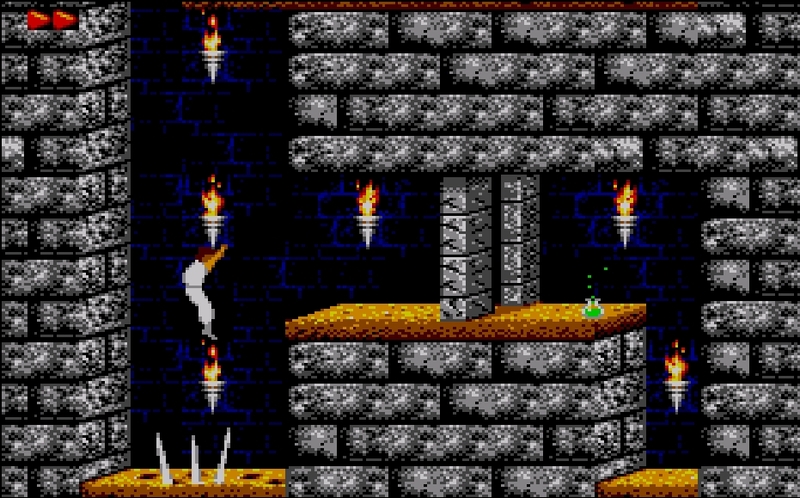 They add another feather to PoP’s cap, marking a significant departure from the projectile weapon combat that dominated much of the 8-bit market. The jousts are dynamic and, again, supremely animated, offering a cinematic edge to proceedings. It’s possible to button-bash through a lot of fights, but a bit of timing goes a long way, and there are occasions when a bit of dexterity and thought pay off, such as edging an otherwise-indestructible skeleton warrior off a ledge and into a pit. 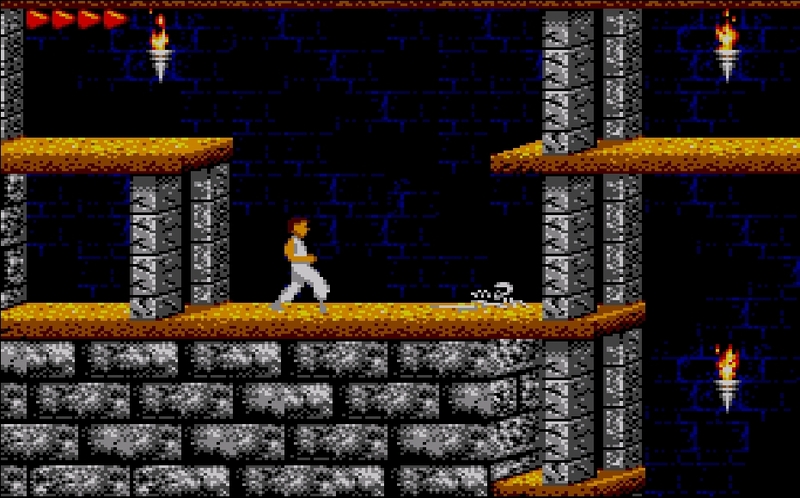 Prince of Persia is packed with great moments, and the player must keep their wits about them at all times, as danger is an ever-present, whether you can see a hazard or not. 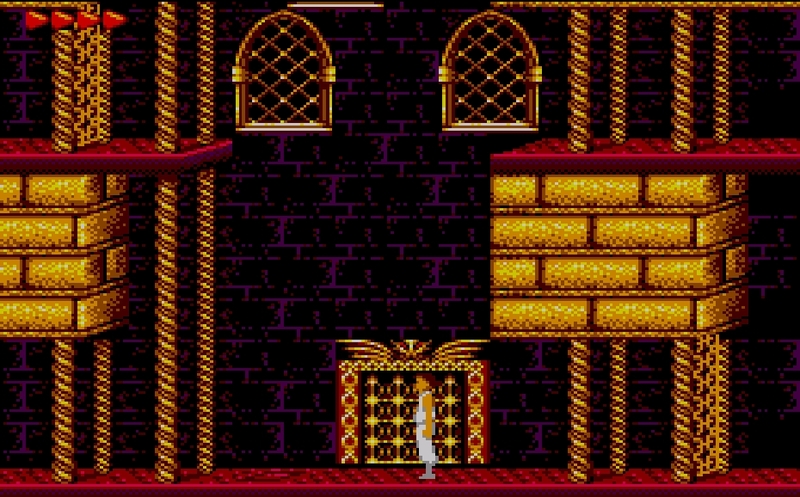 Spikes, guards, collapsing floors and looming chasms must all be negotiated, though one of the Prince’s biggest foes is his own doppelganger, who springs from a magic mirror in a sequence that carries a remarkably spooky cadence. He pops up now and then, halting your progress by standing on switches that lock the exit door (whilst wearing a smug grin, I’ve no doubt) and even snaffling one of the invaluable health potions right from under your nose. ...I can wait as long as you can, you smug git. Expansive levels and a cerebral outlook make PoP a pleasure to play, and it continues to surprise with its tricks. If solutions aren’t forthcoming, sometimes it’s best to take stock. One of the best moments shows that Mechner was very much aware of the value of a change of pace once in a while; the Prince unlocks the level-exit door only for the gate leading back to it to close. Heading back doesn’t reveal any hidden exits or switches, but waiting a few moments by the door leads to some unexpected assistance, as a rat wanders into the screen, triggers the pressure pad, and causes the gate to open once more. 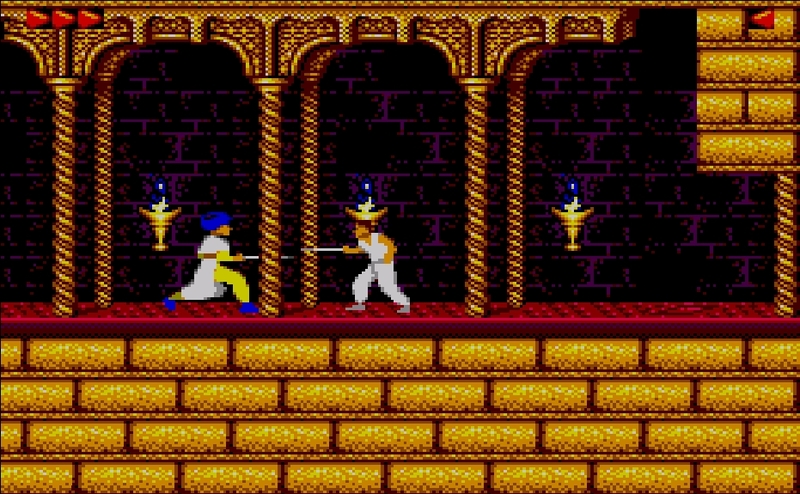 You’ll feel so chuffed that you’ll likely forget that it was the small rodent who earned the credit, but Prince of Persia has a habit of making the player feel good in this way. Impressively, the Master System version outpaces its NES counterpart in terms of its presentation. 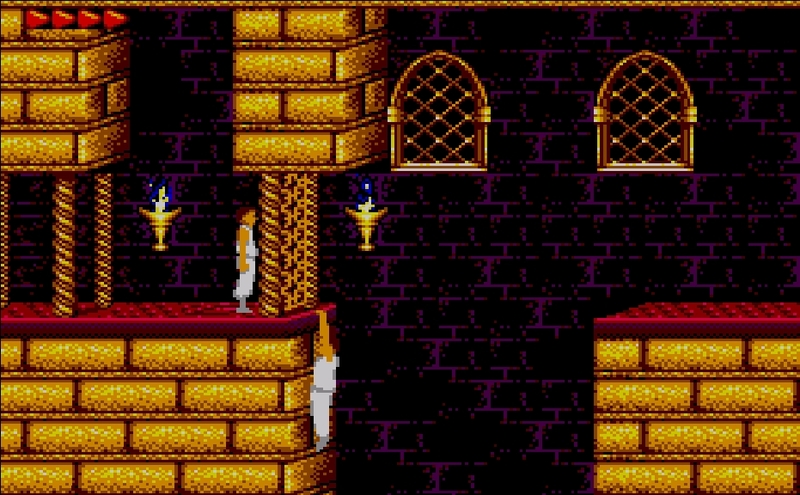 The backgrounds make the most difference, with the NES’s garish and simplistic passages replaced by attractive (though admittedly still rather samey) backdrops with rich colours and extravagant architecture. Music is used sparingly and with a view to affecting the player, with exotic jingles typically reserved for deaths, new levels and those ‘whoa!’ moments; a less-is-more mantra that the likes of Flashback and Tomb Raider would adopt a few years down the line. It’s really atmospheric as a result. There are a few issues however that prevent it from being a complete success. Perhaps as a by-product of the unusual rotoscope animation technique, control responsiveness, particularly on running jumps, can be a bit of a lottery. Sometimes it’s fine, and sometimes they just don’t register at all. This spells bad news due to the number of deaths that result in misjudged leaps, and it’s an issue that’s magnified by the sixty minute time limit you’re clamped with at the beginning. Passwords take time into account, so with a dozen or so levels to finish in a relatively short period, a fifteen minute spell on an early level will likely put paid to your chances of reaching the end. Still, it’s an ideal excuse to put yourself through it all again. 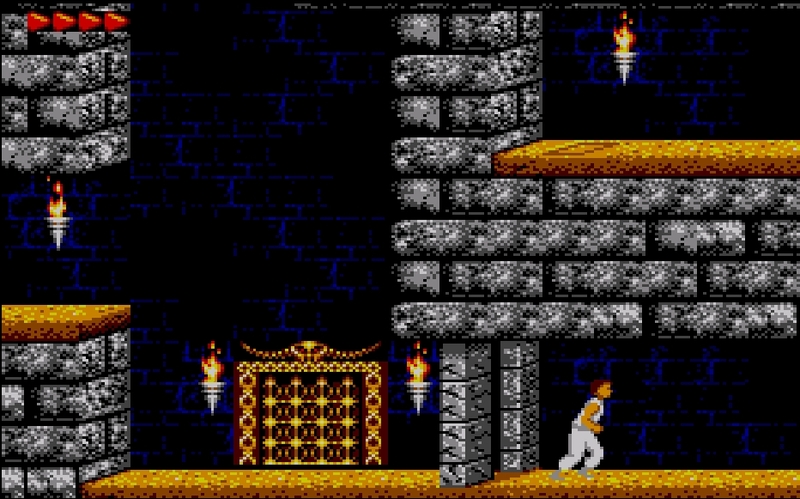 Frequent deaths and level restarts will doubtless wear on the patience of some, and the time-limit is rather unnecessary given the elaborate layouts of some of the later stages, but Prince of Persia is still great. It looks amazing, it’s good bags and atmosphere and invention, and it’s cleverer than virtually every other platform game of its generation. 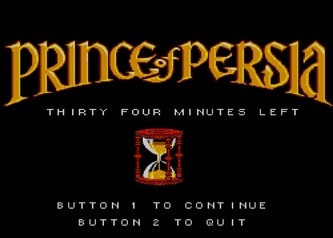 The Prince’s adventure is one that’s fit for King.